When it comes to comfort foods dumplings are pretty high on the list. The team at Horse Bazaar are taking dumplings to a whole new level of cosy by offering a dumpling and massage combo on Tuesday nights. 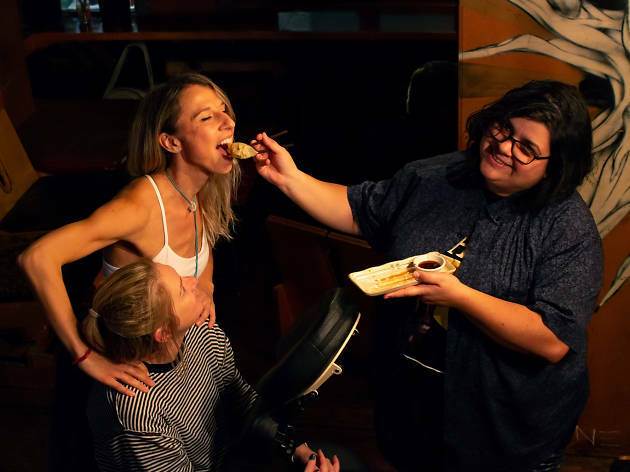 Every Tuesday night at Horse Bazaar is Dumplings 'N' Massage night where you can get three dumplings and a ten-minute massage for $15 (plus online booking fee). There are six flavours to choose from ranging from Horse Bazaar's classic pork and vegan dumplings to stranger concoctions like fried cheese, Nutella and nuts and the very experimental 'Aussie breakfast' dumpling (that's egg, bacon and Vegemite). Your massage will be delivered by resident masseuses from Soul Aquarian Therapy who will work the knots from your back as you work the dumplings into your mouth. Make the worst day of the week just a little bit better – Dumplings 'N' Massage is on every Tuesday at Horse Bazaar. Bookings are a must and can be made online.